Our exit from Detroit was facilitated by having “pre-check” on the tickets but the $50.00 Lounge member entrance fee for Delta was not! We discovered a nearby “Wine tasting shop” where we sipped some good wines with crackers and cheese for about $20 dollars (for 2) and our noon departure supplied lunch. 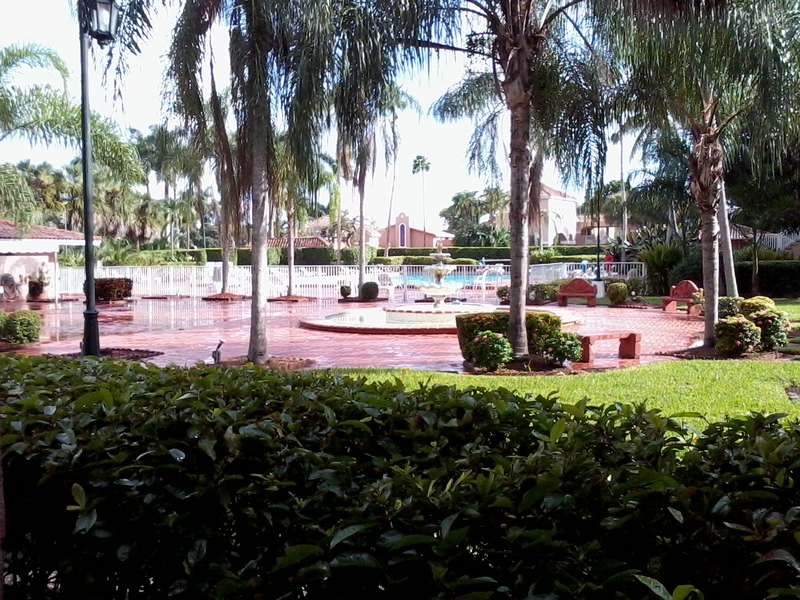 We checked into our favorite Grand Palms Hotel around 4. And this is one of the reasons we stayed there…beautiful Olympic pool about 50 feet from our door, the other reason was that Mike’s family lived nearby. 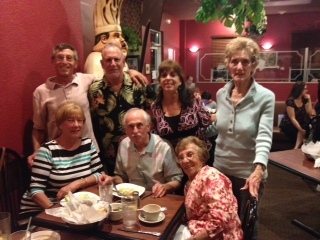 Mike’s sister Syl Hutt had organized a small family dinner at Sergio’s that eve. Introductions: Syl on right, me behind, Mike, center with Fran on left, friend of William (AKA Waldo)behind her (Mike’s nephew) and center, Michael and Beth Berko, (Mike’s niece). It was a marvelous meal in spite of the yelling…due to the noise factor of a popular restaurant …..but even that was fun. Good food and a wonderfully vibrant family. All my family are Catholic and Mike’s family are Jews, but as long as we don’t discuss politics, it has worked for 47 years. The next night we had dinner at a Cuban restaurant with Mike’s brother and wife Marlene. There are an amazing number/variety of dinner restaurants around here! Chuck got here early and chose a quiet, corner booth,and we were able to have a normal conversation. 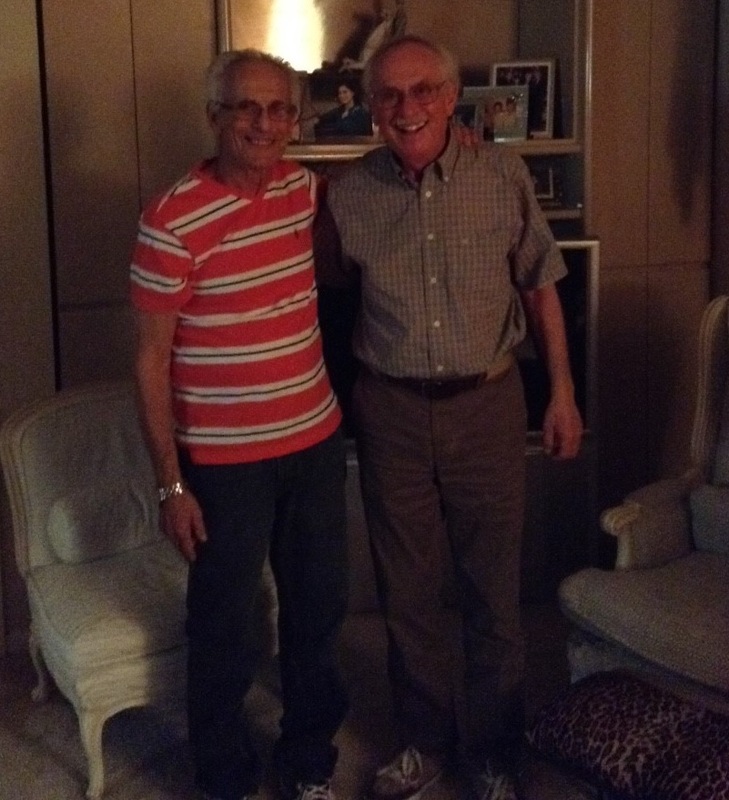 And these are the two brothers, Chuck and Mike. I was surprised that the businesses’ happily take reservations but seat you where they want…hence Chuck was early. Neither phone or email work nearly as well as personal conversation. On Sunday, Syl invited us to a brunch she prepared at Beth and Michael’s house….but refused to say what spices she included in the scrambled eggs! Syl also took the picture….and her eggs disappeared in the first go-round. Since it was our second get-together and feeling more relaxed, it was a bit more controversial. We did touch, but just a dab, on politics and religion. 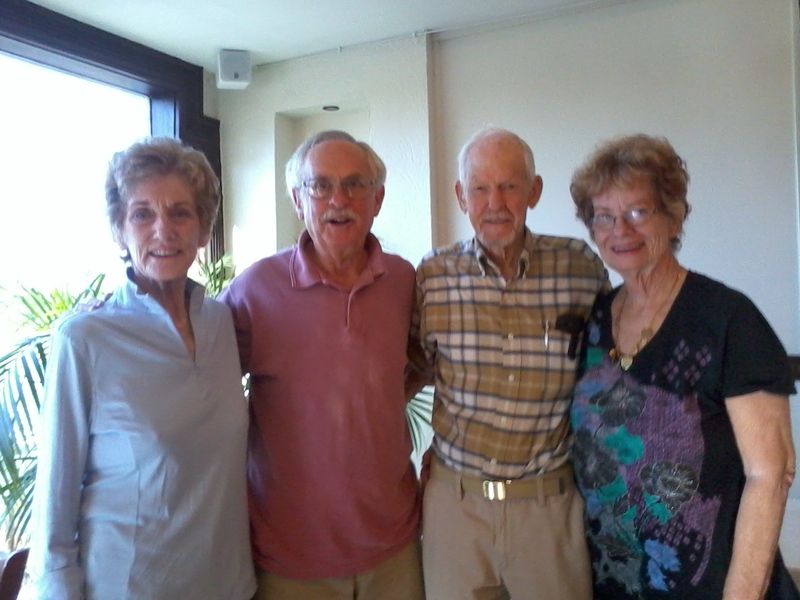 Back to the hotel to meet John and Gael Anderson, from Sarasota, and friends for 50+ years. The Village Tavern was our dining choice. The outside patio was quiet and not crowded. At a center table were 2 young I-Phone-connected women with 5 leased dogs. Quiet… at first. Then, of course, smelling food and bored, they began to yip and yap….yap…yip.. while the women tapped, tapped on their phones. Finally I stood up, “Please SHUT the dogs up, and since you are finished, take them away so we can eat!” And they did! Lovely and so was the clapping as they left. The next morning Mike and John wanted to visit the University of Miami, their Alma Mater. Gael and I jumped at chance to visit Macy’s. We agreed to meet at a certain time and place. Ha. Finally I asked a Macy’s sales attendant to page her….”Oh no” she said, “you’ll have to go to the main mall and they’ll page her.” “Oh no”, I said, “We’re here in Macy’s not in the center.” I then found a Manager who said “Of course we’ll page.” But then I saw her. I don’t remember where or what we ate that night…we laughed so much. 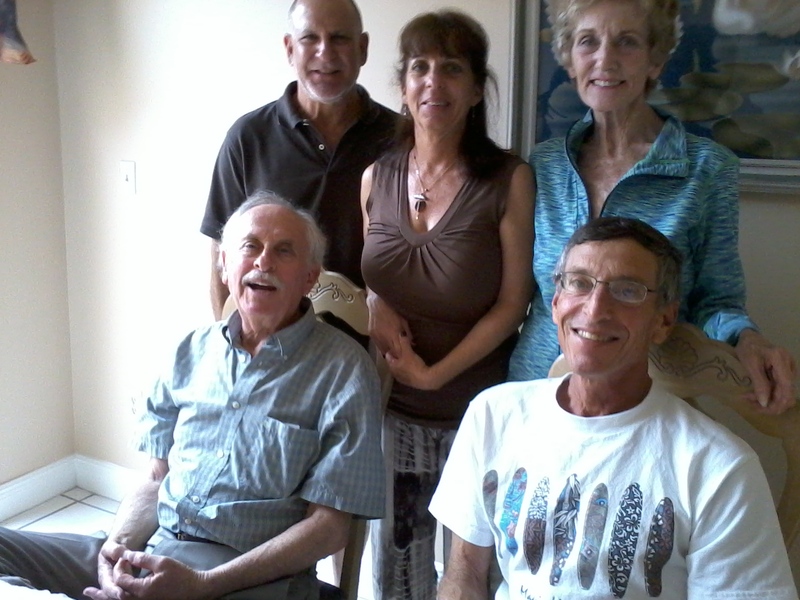 After Gael and John left the morning, we drove to Miami to visit Ray Skop, Mike’s grade school friend. He was recuperating from a major stroke in an assisted living facility. I went outside to read and give them some privacy but all I heard going and coming was genuine laughter. The next morning Chuck called us to meet for dinner at “La Carreta” because Toon wasn’t up for going out. He filled us in on their daughter’s continuing battle with Lupus and how little education/research was available, and consequently, medication for the pain. We went back to their home and met Rachel Cannon, friend and surrogate aunt to Toon. Rachel took this picture: Marlene on right, then Mike, Chuck, Toon and me. When Toon has sufficient medication to control the pain, she is a lovely very bright young woman, extraordinarily creative and personable. And trying to survive! Our last day Syl met us for lunch and farewells. 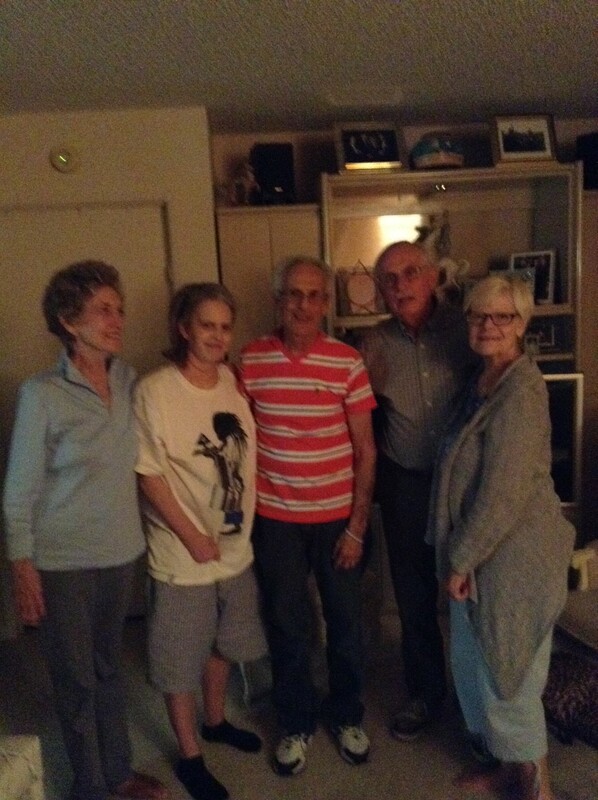 It was a bit sad that we had to travel so far to see Mike’s family but worth it. There were many cousins we missed…but the next time. 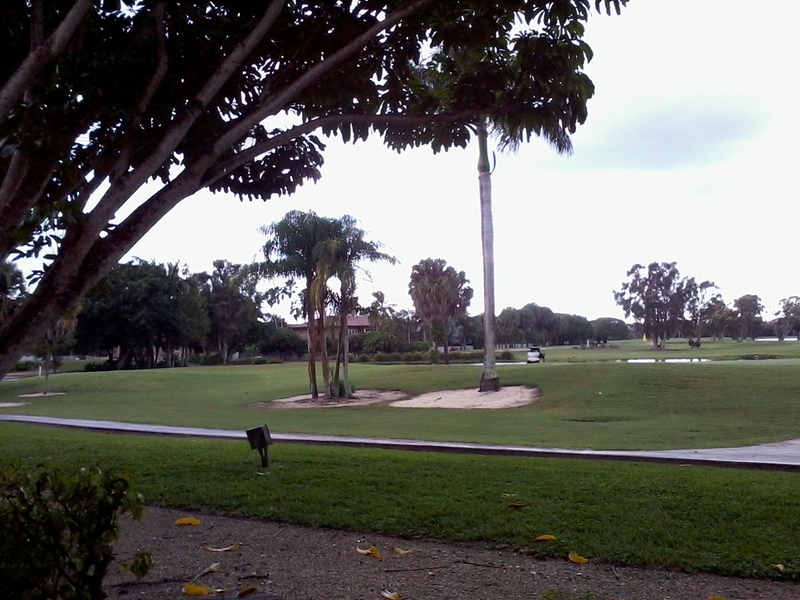 After a final swim, I sat on our back patio watching the leisurely golfers and ducks nibbling their way around a pond…beautiful. Tomorrow, early departure.